Lake Worth Movers – We know that moving can be very stressful. That’s why we’re here to help. At Discount South Florida Movers, we will set your mind at ease that the job will be done well. Our team of professionals has been helping people in South Florida for over fifteen years. We always put the customer first and your satisfaction is our highest priority. Let us know how we can help you. Our experts can handle as much of your move as you need. If you need help navigating through what needs to be done, we would be happy to guide you through the process. We also have high quality packaging material if you need it and our professionals can even do your packing for you. Come get your free estimate today and you’ll be amazed at our low rates. Lake Worth is a small city in the middle of Palm Beach County. The city was first settled by freed slaves who settled on the shore of what is now known as Lake Worth Lagoon. The land was subsequently sold to Palm Beach Farms Co. After the expansion of some railroad into the area, it was developed and the population soon exploded from 28 people in 1912 to the 35,000 that are there today. There are many attractions at in the city, especially around their beach area. The beach is one the last few large tracts of public space in the region. It’s also famous for its William O. Lockhart Municipal Pier which creates some of the best surfing in South Florida. In downtown, there is also Bryant Park which features a bandshell used for concerts. 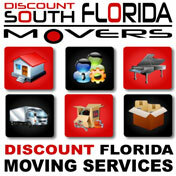 Discount South Florida and Lake Worth movers provide low rates on residential, commercial, piano and long distance moving.